Martha Stewart's personal Presidential de-briefing follows. Enjoy! "Think of the great following Martha has throughout the country - There's no telling how she's broadened my base today," President Bill Clinton said at the luncheon. had become the first to censure President Clinton. 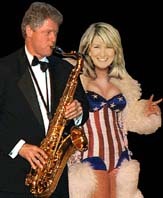 The sixth-season premier of Martha Stewart's daily television show, "Martha Stewart Living," was to have been devoted entirely to a luncheon date with Bill Clinton. "After reflection on subsequent events... We feel that airing the program would be inappropriate at this time." What a crowning jewel that get-together must have been! The afternoon affair included an all-American meal complete with wild stallion, Martha cheesecake, pizza-to-go, green Jell-O, and an after dining dance and cigar. "The president ate with gusto," Stewart later mentioned. A monogrammed set of bedroom pillows. "I'm sure he'll enjoy using these," Martha said as she posed with a pillow for the camera. ended the perfect afternoon affair with the trademark hug.